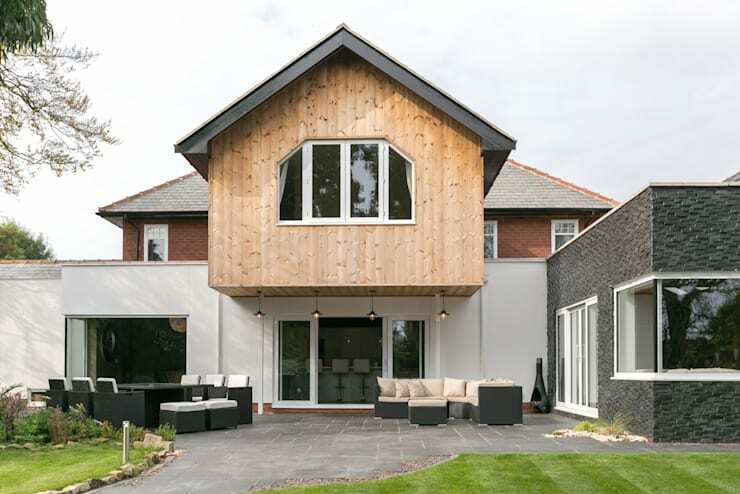 Today we are going to travel to the United Kingdom where design professionals SDA ARCHITECTURE LTD renovated a tired, dated and lacklustre 1,600 ft three bedroom home. The client wanted to reinvent the property into a modern family home with 5 bedrooms and features that would give it the ‘wow’ factor. The team of architects delivered a home rich in textures, shapes, volumes and style. What's more is that when you look at the home from the front and when you look at the home from the back, it looks like you are looking at two incredibly different homes! 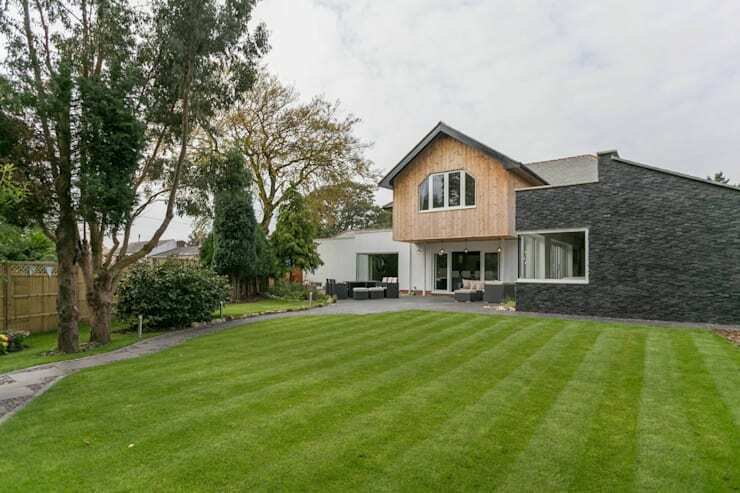 The property was also brought up to code 6 for sustainable homes and has been nominated for numerous awards including Regional Best Extension Design Awards 2014, LABC Design Awards for Best Extension in 2015, Daily Telegraph Design Awards 2014 and UK Best Driveway Award Winner 2015. From this side of the house, we come across a white plastered facade with light wooden cladding and dark grey stone cladding. The mix of materials is very aesthetically appealing and eye-catching! The home is double-storey and rather large and expansive with large glass windows and doors spilling out onto a spacious garden area. Don't you love the manicured lawn and well-organized trees and plants? The mix of materials is very effective and adds a earthy, natural and slightly rustic touch to this contemporary home. If we look at this side of the home a little bit closer, we can see how a tiled terrace features comfortable and durable outdoor chairs and tables. This allows the outdoor space to be used for dining or relaxing with a book or a cup of tea. The wooden cladding section of the home extends over the terrace, providing it with some covering and shade. Don't you love the trendy lamps that drop down from underneath it, creating a beautiful outdoor ambiance? Do you see how the white, grey and wooden tones make for a warm and earthy look and feel? From the front of the house, it looks like we have stumbled across a whole new piece of architecture. 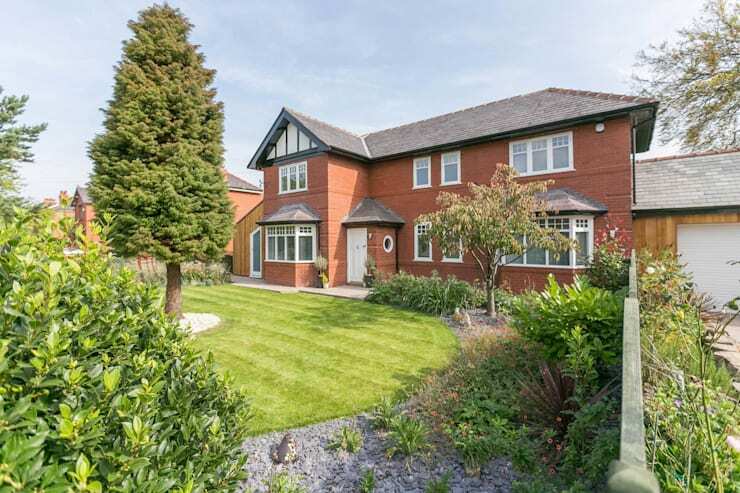 This home looks very traditional and classic with a red brick facade, grey roof and white finishes. It contrasts dramatically with the modern and contemporary facade that we see at the back of the house. The traditional house works in harmony with the beautiful front garden, which makes just as much of an impression as the architecture itself. You don't have to have a big front garden to pack a punch, however. Have a look at these tips for making a big impression with a small front garden. If we go inside this extraordinary home, we come across a wonderful mix of modern and traditional design. The parquet floors, blue and grey walls and white finishes are very appealing, while the sunlight flows in through the large glass windows and doors. Very careful attention has been paid to every detail, which we can see even in the entrance of the home. Do you see how the artwork creates a beautiful and personal ambiance? The lighting fixtures add a stylish touch to the interior design! Even the carpeting on the staircase is classic, homely and elegant. 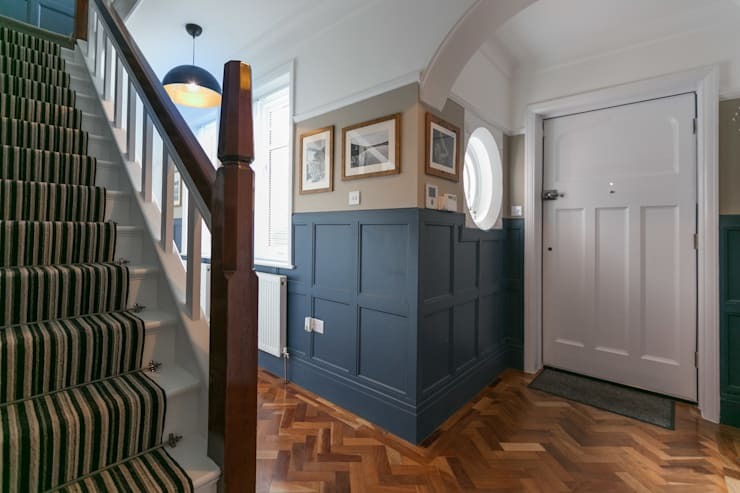 If we make our way up the classic staircase, we can see just how beautiful the interior design is. 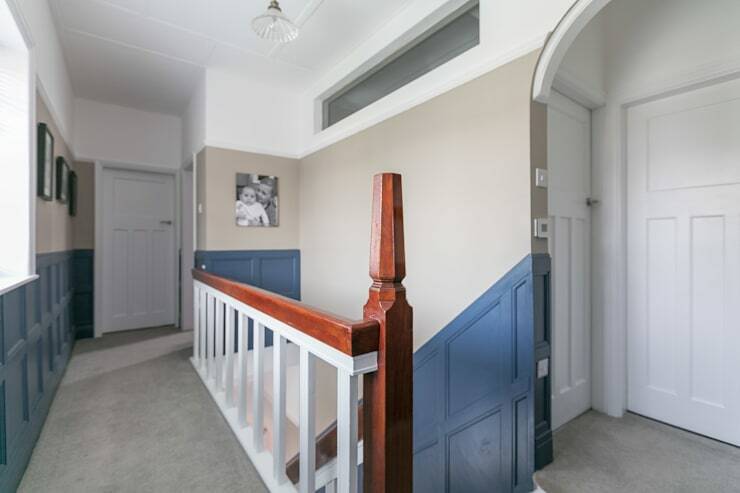 The grey and blue tones continue to the second floor while the white finishes are clean and simple. Do you see how the natural light works in harmony with the colour palette, ensuring that the interior spaces look expansive, light and bright? The open plan nature of the home is very appealing and sophisticated. Do you see how the rooms flow into one another, making for a very interactive and engaging environment? 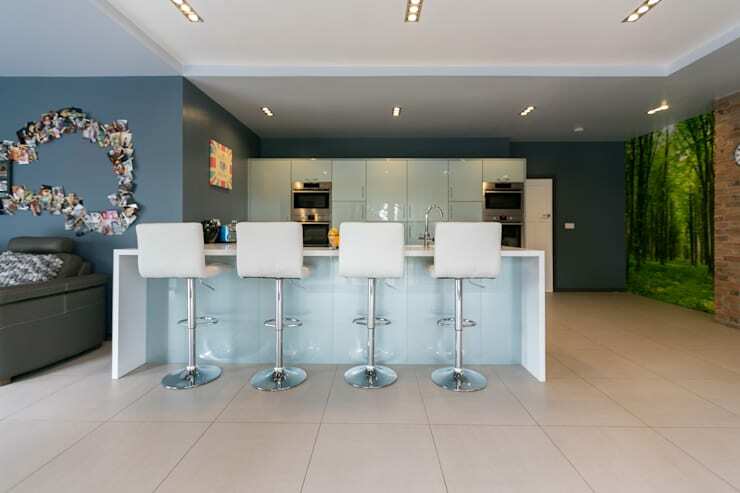 The kitchen features powder blue cabinets and drawers, which work in harmony with the grey and blue walls and white floors. The kitchen island creates a subtle division between the cooking area and the rest of the home, while creating an extra area for cooking and preparing food. It also provides this space with extra storage. 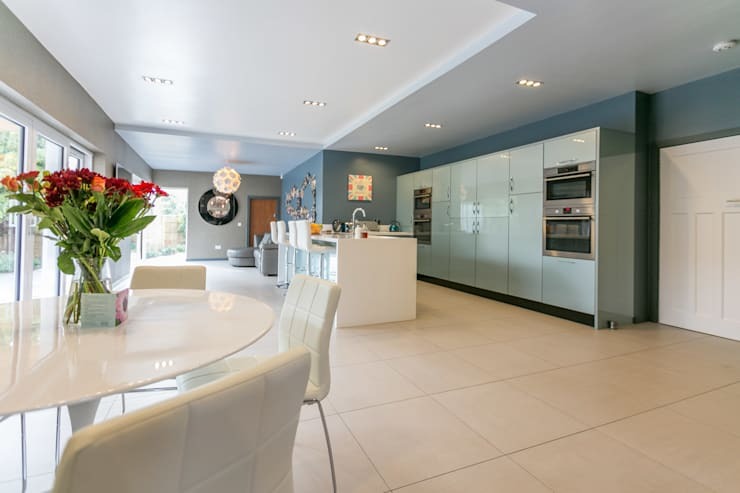 In a home like this, the chef can chat to guests or family who are in the dining room while they work away in the kitchen! Do you see how the bar stools create a very functional design when it comes to the kitchen island? This is the perfect spot to relax with a bowl of cereal or a cup of coffee! In this living room, we come across a predominantly white design. This is a great example of how you can use texture and tones to create a beautiful and elegant look and feel, without having to use too many colours. 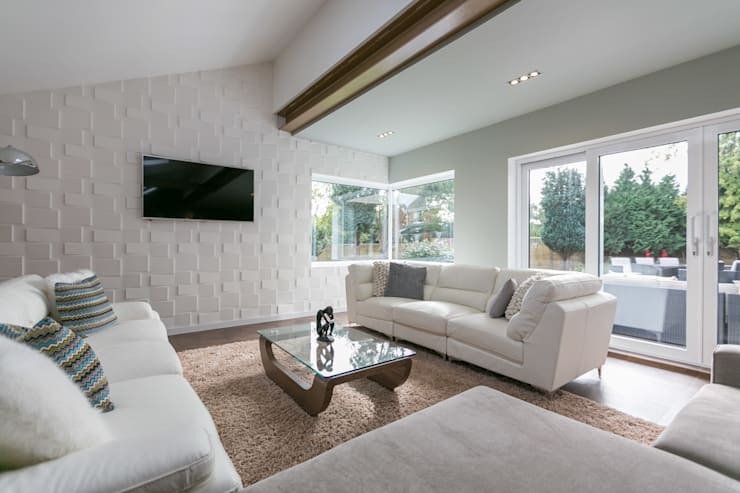 The textured walls work in harmony with the smooth white sofas, while the cushy rug adds a homely touch to the space. A simple glass coffee table completes the look. Sometimes less truly is more! If you've enjoyed exploring this home, you'll love these 13 modern ideas to cover your house walls. Are you impressed with this extraordinary home?